President Peggy opened the meeting with her typical grace and style. The Pledge was led by Larry Miyano and the invocation was given by Kris Anderson who appeared to have found it in a giant fortune cookie. It went like this, “May today there be peace within. May you trust that you are exactly where you are meant to be. May you not forget the infinite possibilities that are born of faith in yourself and others. May you use the gifts that you have received, and pass on the love that has been given to you. May you be content with yourself just the way you are. Let this knowledge settle into your bones and allow your soul the freedom to sing, dance, praise and love. It is there for each and every one of us”. 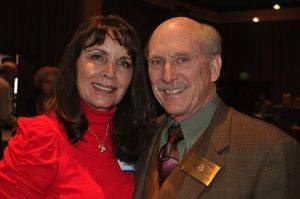 President Peggy announced that Gary Bondi is seriously ill in southern California with GBS. Cards and well wishes can be sent to him at: Eisenhower Medical Center, 39000 Bob Hope Drive, Room 2011B, Rancho Mirage, CA 92270. Prayers are needed for his recovery. Speaking of recovering, Jack Tolin is recovering from three cracked ribs sustained in a recent fall. Finally, the wife of Past President Ed Anderson (1970/71) is back under medical care after experiencing complications associated with triple bypass surgery. Katie Barr (welcome back!) introduced the one visiting Rotarian who wandered in to our meeting today, one Casey Williams from the West SR Club. BTW, also a big welcome back to Dan Wright! 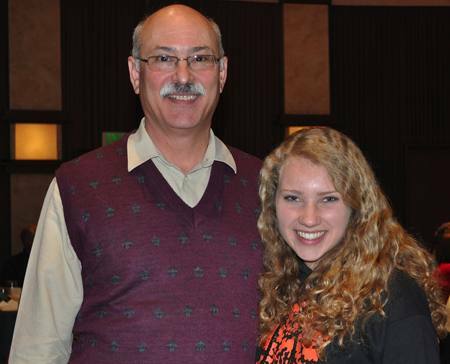 Rotarians, we miss you when you’re gone! Unfortunately, the guest list was thrown away after information that had been recorded (but apparently not saved) on the writer’s computer due to a human brain malfunction. 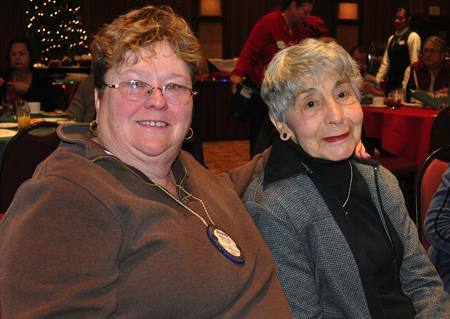 That brain does remember that Nancy Bello was in attendance along with new Rotarian, Troy Ingold’s wife. 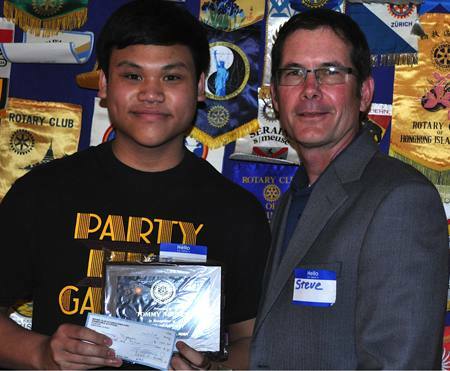 Also in attendance was honorary Rotarian Riley Orton, and today’s student honoree, Tommy Nguyen. Dan Walker’s wife, Catherine joined us today and Rich de Lambert introduced guest Terri Derr, from Cardinal Newman High School. The following Rotarians and spouses were recognized for their generous contributions of at least $10,000 to the Foundation for scholarship awards, with their collective donations totaling over $50,000. 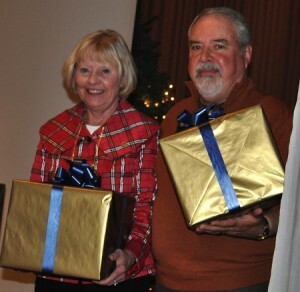 They are: Nancy (Mrs. Larry) Bello for the Lawrence P. Bello Memorial Vocational Scholarship Fund; Ray Dorfman for the Joe Dorfman Memorial Scholarship Fund; Wally Lowery for the Wally Lowery Honorary Business Scholarship and Eileen Carlisle for a donation to SRJC’s Shone Farm in the names of her mother and father. Cathy Vicini loves giving wine away almost as much as money. I didn’t get the details, but it sounded like she was giving away a bottle of pinot to anyone who comes within 25 of the winning number for the drawing today. With a pot this week of $1,147, young Riley Orton drew the ticket of Vickie Hardcastle (who was conveniently sitting right next to Riley…….hmmmmmm, something fishy about that! ) It became less fishy, however when she pulled the Four of Diamonds instead of a lucky Joker. It is recommended that everyone buy tickets next week when the pot is guaranteed to shoot into the millions…..
Ted Wilmsen announced that the school dictionary distribution program will take place during the third week in January. A new dictionary has been acquired and will be given to students and teachers in 28 schools in Santa Rosa. Sign- up sheets will be available at each meeting, so please sign up. At least one member of a team must have completed the Youth Safety Training Course. This hands on project is one that truly does make a difference in the lives of the students but it also touches all those Rotarians who participate. So please make the time to join in and experience Rotary in action. Jock McNeill is still looking for bell ringers for The Salvation Army. Volunteers are needed for two short two hour shifts on the two weekends before Christmas (December 13 & 14 or December 20 & 21). We have two locations at either G&G Market or CVS on Fourth Street. Let’s make this a successful campaign. Sign- up sheets will be at the next meeting or contact Jock directly. Poinsettia sales were very brisk and Dan Walker proudly announced that we have exceeded our goal of 200 poinsettia flowers, actually ending with 224, 50 of which were distributed Wednesday to seniors at the Vigil Light home. Rotarians joined him after today’s meeting to distribute them as Christmas gifts. Together with the residents Rotarians sang Christmas carols, and shared cookies and good cheer. 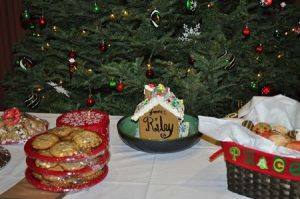 To see all the photos from the party, go to Vigil Lights Poinsettia Party photo gallery. Casino Royale tickets are now available. Our annual fundraiser is January 18th at the Furth Center, 8400 Old Redwood Hwy in Windsor. The cost of admission to this fun event is only $65 which includes appetizers, a martini bar and $25 worth of chips to try your luck at the gaming tables. Debi Zaft is still seeking auction items for this fund raiser and is asking all Rotarians to work to make this a success. Any and all items are needed. Bill Hatcher introduced us to our Student of the Month for December, Tommy Nguyen from Piner High School. Tommy is an accomplished young man who came from a family of Vietnamese refugees to become a true American success story. Tommy has succeeded in mastering all the math classes Piner H.S. has to offer and is taking courses at SRJC. He is also the Piner Class Valedictorian. Congratulations to Tommy Nguyen for his accomplishments and best wishes going forward! President Peggy has really mastered the use of multimedia in order to extract money from club members for their feats outside of the club. Wayne Rowlands was shown rocking out with the lead singer for POISON in several photos. Actually, Wayne has spent the last 3 years putting together a rock concert featuring Brett Michaels to raise money for Salvation Army. Over 6,000 people attended the event held at Fort Mason in San Francisco. For this recognition, Wayne donated $100 to the John Brown Scholarship Fund and $50 to the our club. Tim Fawcett aka Santa Claus showed us his good side in a photo taken at the Nutcracker Children’s party last weekend. Not sure if this cost him any money. 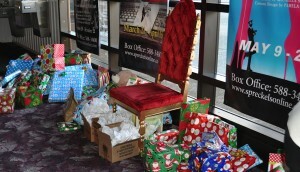 Tim has graciously donated his time and after 20 something years has really grown into the part of Santa! Thanks go to Carrie Ludtke who coordinated the event, as well as Jim Johnson, Vickie Hardcastle and Diane Moresi for their work in making this a great event! Ted Wilmsen coughed up $100 to the John Brown Fund after giving a somewhat confused accounting of his visit to the San Diego area. There he visited mountains he couldn’t name and attended Gordon Shurtleff’s Rotary Club in La Jolla. Blaine Goodwin attended the birth of a new grandchild in Maine. The baby kept him waiting longer than expected and the trip turned into a three week sojourn. Mother and baby are fine and Blaine donated $100 to the John Brown Fund to celebrate the happy event. Steely- eyed Jack Geary then invoked his Sergeant At Arms powers by citing President Peggy for forgetting our club’s 92nd birthday last week. This cost her $50. Craig Meltzner presided over the sale of cookies and brownies (just regular ones) baked by members of the Santa Rosa High School Interact Club. 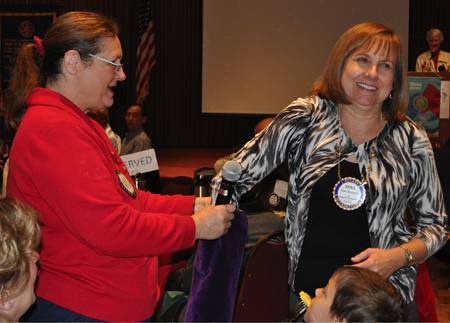 Interact Club member Marlys Jeane distributed the baked goods after high pressure auctioneer Ray Dorfman strong armed the bids to the stratosphere. Thanks to the Rotarians who purchased the goods to help raise money for the Santa Rosa HS Interact Club! Wayne Rowlands introduced chef Gerard Giudice to the club. Girard gave us a brief history of his culinary experience that included stints at several well- known Marin and Sonoma restaurants including his stint with Guy (Guido) Fieri at Johnny Garlics. 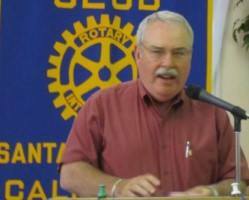 Gerard is a past member of our Rotary Club and is the current president of the Rohnert Park Club. He is also the owner of Sally Tomatoes Restaurant, located at Sonoma Mountain Village. Gerard has served his fine cuisine to our club when we’ve moved over to St Rose for meetings as well as at other events. He’s even served some of the recipes he presented today. Today, Gerard shared recipes he developed (or stole from Guy! 😉 for Sicilian Lamb meatballs, Baked Goat Cheese Salad, Pork Prime Rib Asparagus Lasagna and Brandied Cherry Demiglaze. Enter Nelson Mandela. Herb Brown, Rotary’s president in 1995-96, recalls seeking the South African leader’s support. Mandela agreed to help. “I’m well aware of Rotary and all the work you’ve done, and all the work you did while I was in jail,” he told Brown. At a press conference, with Brown at his side, Mandela asked all the heads of state in Africa to open their doors to polio National Immunization Days. Mandela helped launch the Kick Polio Out of Africa campaign later that year with 1996-97 Rotary President Luis Giay and Rotary Foundation Chair Rajendra Saboo. Almost immediately, Africa’s polio eradication effort was back on track. Using soccer matches and celebrity endorsements, the campaign raised public awareness of polio and helped spur more than 30 African countries to hold their first National Immunization Days. Mandela donated the award’s $100,000 prize to the Nelson Mandela Children’s Fund. “Mandela was a man who overcame unimaginable hardships to emerge as one of the greatest leaders of our time — and one of our greatest humanitarians . . . . [His] legacy of courage, determination, and commitment will forever inspire us to move forward in our effort to achieve a better, more peaceful world,” said Rotary President Ron Burton.